Endive Software is a leading web and mobile app development company delivering effective software solutions since 2010. The high-end capabilities in various domains have made Endive Software one of the top IT companies in USA. We are well renowned for providing an outstanding array of technological services to various business domains. Our team of skilled developers has hands-on experience in creating new age and modernized technologies for various business specific requirements. 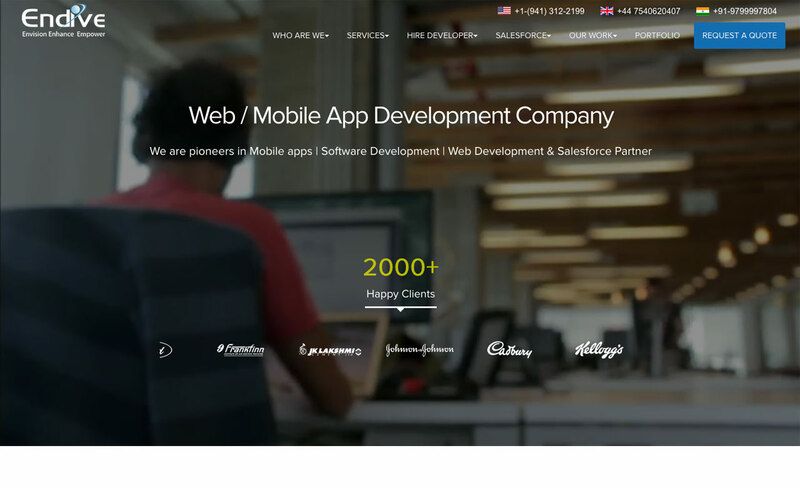 Our Expertise •	Mobile app development - iOS and Android devices •	Software solutions such as CRM development, Oracle ERP implementation •	Customized web design and web development services •	Digital marketing and SEO services We firmly believe in business ethics and follow a transparent approach while dealing with the clients. We have fixed but cost-effective payment policy to ensure hassle-free project handling. We deliver tailored and timely solutions to our customer’s right from the beginning till the final execution of the project. We, at Endive Software focus on building sustainable relationships with our clients and in securing strategic alliances. With our advanced software solutions and quality assurance techniques, we have earned the trust of many valued clients. Utilizing the innovative approach, we help our customers gain competitive edge, improve efficiency and get system stability, all at optimal cost.